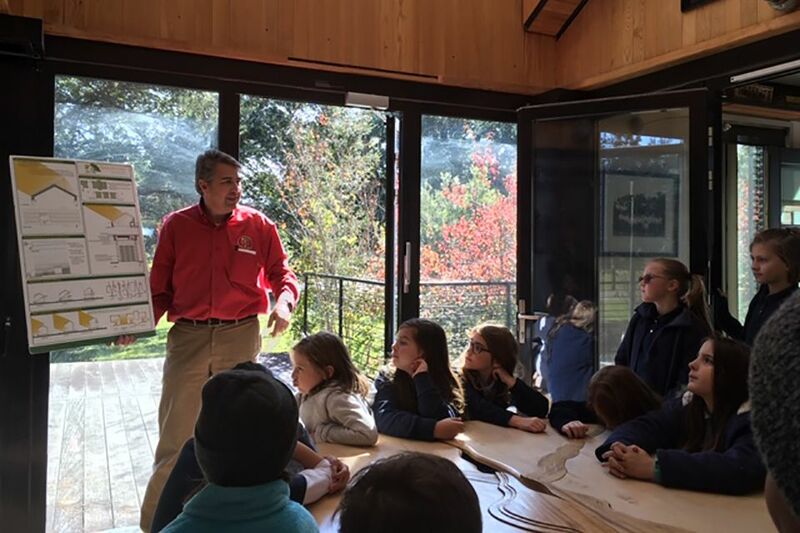 Fourth graders explored architecture this week with the help of some local experts. Lafayette architect Maureen Dugas Foster encouraged the students to notice architectural features and materials visible at the Hilliard University Art Museum. The students viewed architectural drawings, models and photographs of several A. Hays Town buildings exhibited at the museum. Then, using cardboard, they constructed original designs and represented them in elevation drawings. Following the Hilliard visit, Geoff Gjertson, architecture professor at UL, gave the group a tour of the Beausoleil House, the award-winning solar home designed and constructed in 2009 for the DOE Solar Decathlon. Students were most interested in the energy saving design choices and materials.